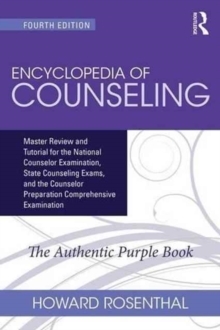 With more questions and answers than any other edition, the Encyclopedia of Counseling, Fourth Edition, is still the only book you need to pass the NCE, CPCE, and other counseling exams. Every chapter has new and updated material and is still written in Dr. Rosenthal's lively, user-friendly style counselors know and love. The book's new and improved coverage incorporates a range of vital topics, including social media, group work in career counseling, private practice and nonprofit work, addictions, neurocounseling, research trends, the DSM-5, the new ACA and NBCC codes of ethics, and much, much more.